Spinal adjustment / chiropractic manipulation is a very effective way of treating back pain and neck pain and improving how your spine moves if it is stiff or immobile. Each manipulation is also known as a spinal adjustment or, simply, an adjustment and it often results in an immediately noticeable improvement. The soft tissues of the body are the muscles, nerves, tendons, ligaments and fascia. 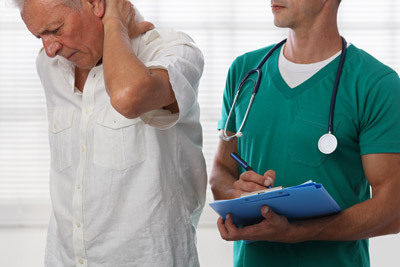 They may all be a source of your pain and, if so, can be treated in a variety of ways. Soft tissue therapy, such as massage, is the manual manipulation of these soft tissues of the body to help alleviate the discomfort associated with everyday stresses, muscular overuse and many chronic pain conditions. If employed early enough after accidents involving trauma and injury, soft tissue therapy can greatly reduce the development of painful conditions. Instrument Assisted Soft Tissue Mobilization (IASTM) is a process in which the clinician uses a set of hand held instruments to break down scar tissue and fascial restrictions in the soft tissues. Making you feel better is half the battle. Keeping you that way is the other half. If you return to the cause of your problem, which is so often sitting at a desk, it is likely the problem will return sooner rather than later. But by doing regular exercises that stretch tight areas and strengthen any weakness a more enduring solution to your problem can be achieved. At Momentum Chiropractic we will always give you the right advice you need to stay better. Rehabilitation exercises can range from being very simple and quick to do to being very in-depth and challenging. What you are given will depend on what your problem is, your level of fitness and your aims. The goal of proprioceptive muscle testing is to test the patients’ ability to withstand an external force. External forces are the cause of injury and our primary defense against them relies on our sensory ability to detect them and our motor response to protect ourselves from them. Indeed, the primary advantage in having a nervous system at all is to allow an organism to adapt to or resist changes in the external environment. It is suggested that the basic unit of health should be strength. Acupuncture can be used to treat painful conditions, such as neck pain and back pain, on its own or in conjunction with other treatments. At Momentum Chiropractic Clinic we use acupuncture in a way that is more in step with a Western medical approach and it sometimes referred to as ‘dry needling’. Very fine needles are inserted at certain points on the body, which stimulate nerves under the skin, and in muscle tissue causing pain-relieving substances, such as endorphins, to be produced. The primary aim of this type of acupuncture is to alleviate pain and kick-start a healing response. This taping technique uses elastic adhesive tape that support joints and muscles without restricting range of motion, unlike conventional rigid tape. It can be worn for several days at a time and is resilient to getting wet in the shower and sporting conditions. Its popularity has grown considerably over recent years and the tape is often noticeable on elite athletes. However, for patients in a clinical setting it can help speed up recovery by providing comfort and support. By using the drop functions of the chiropractic table, this technique can be used as an alternative to; or in conjunction with regular manipulation or mobilisation. Some people find that it is a lighter method of adjusting the joints, yet it is effective at improving mobility and relieving symptoms. An orthotic insole is a device is worn inside your shoes, Orthotics are used to control the alignment and function of the foot, this is done In order to treat or prevent injuries caused by the misalignment of force going through the bones, joints, tendons and ligaments. Some people suffer from excessive pronation (when your feet roll in) or excessive supination (when your feet roll out) which can lead to other problems throughout the body if not corrected.